Today as I was going through pictures from my last trip to Thailand I came across this particular photo that I had taken while at the Grand Palace in Bangkok. 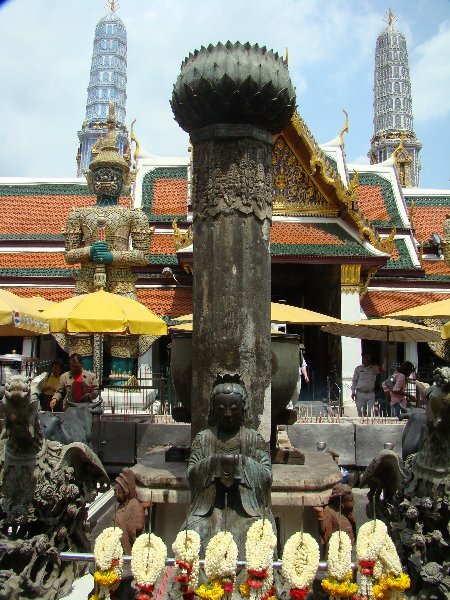 The photo is that of a small shrine located near the main temple of the Grand Palace. I don’t know what it is about certain pictures but they can bring you back to a moment in time as if you never left. Everything about that moment is crystal clear and it will stay with you for a lifetime. I can still smell the incense, feel the heat on the back of my neck and remember exactly what I was thinking. Instead of finishing a post that I was working on I just let the photo wash over me and went back to that place. Just like the photo there is something about Thailand that draws certain people in. People from all walks of life, educational backgrounds and gender. Thailand washes over them and becomes more than just another tourist destination or place to explore. Exploring Thailand has in turn pushed me to explore myself. And days like today it’s good to see photo’s that bring it back to me when I can’t be there…it’s also good to know that no matter how old you get you can still find out new things about yourself and open up new chapters in your life. The post I was going to write can wait till tomorrow…I think I’ll let this feeling last a little longer. Talen, I believe that is why I take photos – to savour the moment. And as you get older, you need photos to jog those saved moments. In Thailand, for me anyway, there are richer moments than elsewhere. I couldn’t imagine being this happy living anywhere else.